JanetheWriter Writes... : We Miss You. We Love You. As I write this letter, I’m also listening to the reading of names that is part of the 10th anniversary September 11th memorial service. If you were here, I know you’d be watching and reliving your own harrowing September 11th adventure in your beloved city. I’m not quite sure how you landed in the Big Apple without your cell phone on that day, but as I understand it, a too-small Kate Spade knock-off purse was the culprit. As a result, not a September 11th goes by that I don’t think about Jean Abarbanel forking over all her loose change so you could call Daddy on a pay phone to keep him posted about your whereabouts. Each year on this date, too, I think of you leaving 633 – you’d come in for the Union’s Executive Committee meeting -- and making your way clear across town to Amy’s apartment on 42nd Street between 10th and 11th avenues. When your attempts to catch a cab were thwarted by others unwilling to share a ride, you began the long trek west – which was no small feat for you, even 10 years ago. After a brief rest in Bryant Park, you continued on to The Armory, where you spent the night, Cooper constantly at your side. When you finally made it home on Wednesday, you were, you said, glued to the television for days, not unlike that dark week in November of 1963. 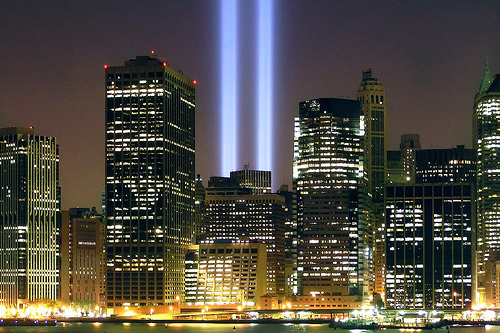 On this solemn, milestone anniversary, our country – individually and collectively – remains stunned by the magnitude of evil expressed on that day and overwhelmed by the loss of innocent life even as we’re strengthened by the community, good works and hope it continues to engender. You would like that. The Mums, next Sunday we’ll honor and remember you as we unveil your gravestone. But, what has been said hundreds and hundreds of times this morning about so many loved ones is equally true about you: We miss you. We love you. You are ever on our minds and in our hearts.